I had gone to the Rookery a few weeks ago and taken a shot of the lobby, but today was the day of the Architectural Foundation tour which gave me access to the second floor, spiral staircase, and the Burnham library where they planned the Chicago Exposition (have you read Devil in the White City?). It was awesome!! If you are ever in Chicago, this is a great tour! This is the spiral staircase that served as access to the 12 floors of the building as well as a fire escape (rather than have one destroy the aesthetics on the exterior. The Rookery was the site of Chicago's first City Hall and first public library, filled will books sent by Queen Elizabeth after the Chicago fire. Frank Lloyd Wright designed the renovation of the interior in the early 1900s. All in all, an exciting building historically and architecturally. Glad you made it on the tour! :) This is a fab photo of the Rookery. Congratulations on making Trending. Well deserved. The repeating sweeping curves are magnificent. What a phenomenal image...an instant favorite! Many could have taken a nice photo of this, but I think you did an exemplary job! That is one fantastic staircase! Wow, amazing shot awesome pov. I visited The Rookery a few years ago! Beautiful! We were staying nearby this week at the Palmer House Hotel. Great capture of the staircase. Love the pov. Very cool staircase. Very nice shot. Going in my favorites. Magnificent!!! An amazing pov !!! Mega FAV! Great looking shot. Sometimes we fail to see the obvious photo opportunity when we are so driven to go forward. Fantastic photo of a fantastic building! This is a magnificent shot. Love. Just glad I don't have to climb it!!! Love that pov and the beautiful architecture! Fav! Wow - fantastic architecture and awesome image! Beautiful light and lines! Great capture! FAV!! Gorgeous perspective of this impressive staircase! i hope to shoot the one at the Guggenheim in a couple weeks. Fav! Taffy, I have said it before and I will say it again. Your shots are amazing. Fav! @777margo Thanks, Margo! They would only let us go up one flight, unfortunately, but it was still exciting to be able to be on it, photograph it. It was first built in the 1880s, so it was amazing to think about who had walked up and down them, including the planners of Chicago. @elaine55 Thanks Elaine. Actually, we were only allowed to go up one level, so we are, in fact, looking up, not down. I wish we could have gone to the top and looked down it as well. Thought I had to sit down to take this as I was getting dizzy! @cailts Oh gosh, I can't believe you were at the Palmer House this week. So were my nephews (and one nephew's wife)! I hope you had a good weekend here -- at least it was pretty clear even if a little cold. Instant Fav Taffy! This is such a stunning image with a real WOW factor! Such an interesting building - how wonderful that you could do a tour and were allowed access! I knew this was your shot straight away! Awesome shot, Taffy. Great pov and clarity. I like the perspective created by the stair well. Just hope you did not have to climb all the stairs to get this shot. Gorgeous Taffy!! Love staircase shots, and you did such an amazing job with this one! At first it was a little disorienting as it was hard to tell whether you were looking up or down, but that is also why it is so wonderful like an Escher sketch. Taffy you have such a wonderful eye for composition, this is stunning! Fav! What a great find and wonderful capture, hope you didn't have to walk up them all. I love these sort of shot, I wonder what it would look like in B&W. We went to chi cargo very briefly a few years bag, never knew about this little gem though. Thanks for the additional info on the building, nice shot. Envious, incredulous, mesmerised, in awe, fav. This is quite beautiful love the way you can feel the dimensions. Fantastic pov, love the designs. Cool angle up the winding spiral staircase. Fav. wow can get lost in that spiral. Very cool shot Taffy - Fav! Wow. Very cool shot. Great eye, and great composition. Fav. Stunning capture. Love it. fav. Great shot up the stairs. You chose your vantage point well, slightly off-center. Love it! It takes my eye around and around! You were brave looking down - a great capture! Love "Devil in the White City," and I love this dramatic, dizzying view! Wow! That's an awesome shot - so imaginative! Fav. Wow. I. Love. This. Fav. Magnificent! Love the sweeping curve. Really interesting. I am tempted to view it by tilting so I'm going doen the interal arches. Love the history. Great find. Very cool capture, love the perspective and geometry! @tremerryn I wish I could take credit, but I wasn't brave and looking down, but sitting on the stair and looking up! WOW! Amazing shot, love it and fav! Absolutely love this photograph, Taffy, as well as the history! I'm envious of your tour. Fav! fabulously captured! what a wonderful bit of architecture! Very wonderful shot. I like the lighting of the sun coming through and of course all the lines and curves. @kathiecb @hinkkd @smithak Thanks Kathie, Kathleen, and Smitha for the favs! Wonderful photo. I have read Devil in the White City and loved it. Another twofold FAV, one for the building itself (LOVE, LOVE, LOVE IT) and one for your keen eye for architecture. Super cooll POV. I wish they had offered the tour when we were in Chgo!!!!! Fav, LOVE staircases, they're such a cool subject. Congratulations on making the PP. Well deserved. Echoing everyone else, above, this is an incredible shot of an incredible building. LOVE it! This is unbelievable and spectacular! Adore this, Taffy. What a fabulous pov. And no wonder you LOVE this place. Fav! Brilliant picture. Love the dof. Fav. Gorgeous staircase and wonderfully shot! 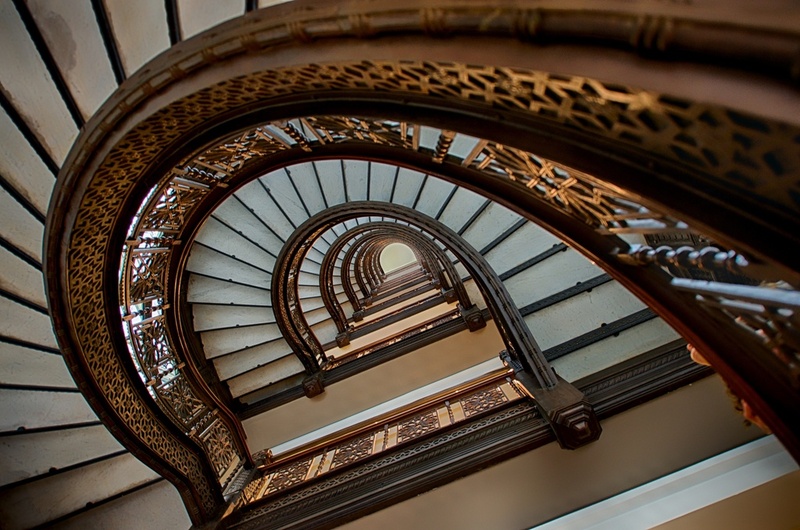 Awesome perspective of an architecturally fabulous staircase! FAV! What an absolutely superb shot! Wonderfully done. Fav! Fav! Super pov! So interesting, such a spiral shot! Great shot, so well seen. Love you're pov. Great study of the stairwell! This is fantastic Taffy, the comp is spot on. Fav. Big congratulations on #1 of the TT. This is really beautiful. Well deserved. Great shot, spirals, arches and tunnels all in one. Fab pov. Wow - well done on the top spot! Awesome shot - fav! Congrats on TT Taffy #1 and a double TT. Well done!! Congrats on the TT Taffy, super shot. Congrats on the double TT. Fantastical!! The repeating pattern and the point of view are all spectacular! Big congrats on making the top of the Top Twenty!! @michaelelliott Hahahahaha, Michael! I think the universe just got mixed up this week! I'm excited and flattered to be in such good company! Thanks Judith, Elaine, Paula, Danny, Mara, Annie, Francoise, and Chris! Being at the top with a shot of my city feels wonderful!! I appreciate your leaving a comment on this today -- what a great way to start the weekend! Congratulations on a fantastic #1. This one really captured people's imaginations. Congrats on the top spot! And a double TT! A stunning FAV! And Congratulations . . .
Congrats on no 1 TT spot Taffy! Well done you! Fantastic capture, Taffy! This remind me of a shot I took at a hotel in Paris. Only yours is MUCH better! Instant fav. I don't know how I missed this. Congrats on the TT! Forever in awe of your work! You have such an amazing eye!